For the first time in years, the Ohio State Buckeyes played on Thursday in the Big Ten Tournament. Today they were fortunate to win a squeaker, 63-61, over a game Purdue Boilermakers team that gave the Buckeyes all they could handle. The Buckeyes have been a cipher for months, and today was no different. For stretches they look putrid, then then look pretty good. They can’t make a three-pointer, and their free throw shooting is abysmal. Today they were 1-14 from behind the arc — that’s a nifty 7.1% for the mathematicians out there — and a limp 64% from the free throw line. Once again, they missed free throws that could have put the game away. They also turned the ball over 12 times, and a lot of those turnovers were simple mental mistakes. It’s got to be maddening for Coach Thad Matta when March rolls around and those mistakes keep being made. With such miserable shooting, it’s amazing that Ohio State won today’s game. If they’d played a better team — Purdue finished last in the Big Ten — they probably would have lost. But the Buckeyes survived and advanced, which is all you can ask for when tournament time rolls around. We can be sure of one thing, though: if they don’t play better, they aren’t going to advance very far. Maybe this game is the one you somehow win when everything goes wrong, and now everything will click into place. Or, maybe this is just another reflection of a team that can’t shoot straight. The Ohio State Buckeyes may not be the prettiest college basketball team this year, but they surely are one of the toughest. 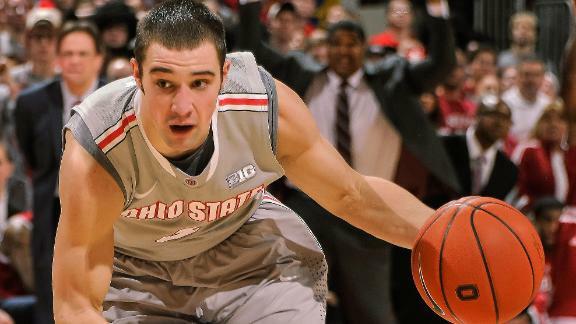 The Buckeyes ground out a hard-fought win over the Michigan State Spartans today, 61-58. The two teams like to battle and play body-up defense, and they showed those qualities today. Aaron Craft played brilliantly for the Buckeyes, and fortunately survived being hurled to the ground by the neck by the Spartans’ Derrick Nix, on a play that provoked a fusillade of obscenity and brought me out of my chair. But the Buckeyes hung tough, played through adversity, and when they needed a final bucket to put the game on ice, Deshaun Thomas stepped up and rattled down a jumper. I recognize that conference tournaments don’t mean a lot, but I’d rather win than lose and go into the NCAA Tournament with some momentum. Ohio State has played well in the Big Ten Tournament under Thad Matta, and they are going to the championship game again — which seems to be an annual occurrence. Win or lose tomorrow, and in the Big Dance, this team has come an awful long way since Wisconsin beat the tar out of them a month ago. Ironically, the Badgers are the team the Buckeyes will face tomorrow, in the final contest of the Big Ten season. Tonight I’m sitting and watching the first day of the Big Ten Tournament. I’m a traditionalist, so I think the regular season champion is the true Big Ten champion. Still, the conference tournament has its attractions. For teams like Ohio State, which has already punched its ticket to the NCAA Tournament, the Big Ten Tournament is a nice tuneup and a chance to stay sharp for the Big Dance. For the desperate teams — like both Purdue and Nebraska, who are playing now — the tournament means a chance to redeem an otherwise tough season. So long as they stay alive, there’s a chance they might win, and win, and make it to the NCAA Tournament. Imagine what it might be like in their locker rooms, knowing they might be playing their last games of the year and can only keep playing if they win this game! So we’ll see how this game ends, and who survives to play the Buckeyes. And when this game ends, I’ll watch the next one. The Big Ten has been tremendously exciting and competitive this season, and I’m expecting nothing less from the Tournament. As I said, it’s a great time for college basketball fans. The Ohio State Buckeyes aren’t playing this weekend. After a grueling last few weeks in the Big Ten meat grinder, and some hard work in pulling out a win over Northwestern at Evanston, the Buckeyes are getting a well-deserved rest. We fans, however, are pining for a weekend game. I enjoy the adrenalin rush the games provide, and I rationalize that the spikes in my blood pressure caused by bad calls from referees during an OSU game probably are good for my system. Every once in a while, you want to make sure that your body can withstand various stresses. Isn’t that what those doctor-supervised stress tests are all about? Getting seriously into a Buckeyes game is just the self-administered version. Still, in a way it’s also nice to have the weekend off. We get to see other teams play without having an enormous emotional investment in the outcome. Today I’ll watch the Michigan-Michigan State game. Whatever the result, it will help the Buckeyes in their quest for a higher seed in the Big Ten Tournament. If Michigan loses, they drop below Ohio State in the loss column; if Michigan wins, Michigan State joins Ohio State and Michigan with five losses in the conference. So today I’ll watch the games with a relaxed attitude. I’ll be husbanding my emotional and stress-related resources for Tuesday night, when Ohio State travels to Bloomington for a make-or-break game against the top-ranked Hoosiers.